Madina Clean! Madina Script has now been updated to include 2 styles; a rough, textured brush version, and a totally clean & smooth version. This gives you the option to completely switch the style of your font at the click of a mouse, whether you’re looking for a more rustic, hand-made style, or a silky smooth finish. • Madina Script – A handwritten script font containing upper & lowercase characters, numerals and a large range of punctuation. 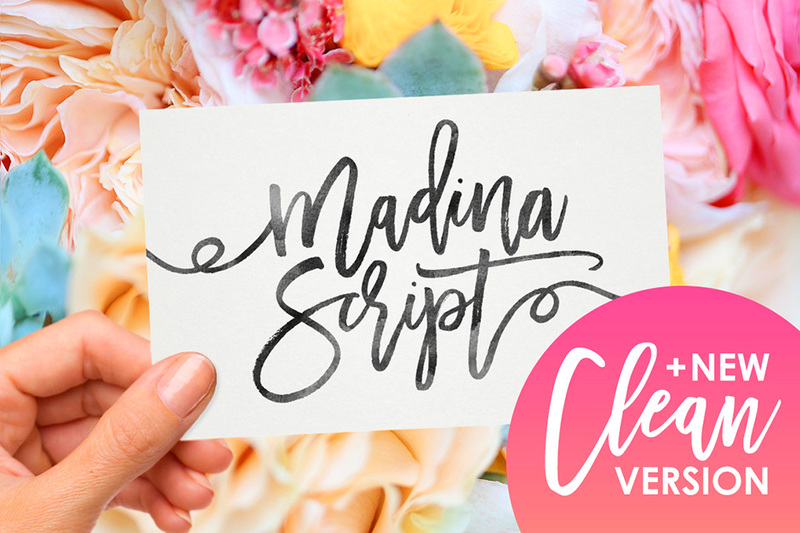 • Madina Script Alt – This is a second version of Madina Script, with a completely new set of both lowercase characters. If you wanted to avoid letters looking the same each time to recreate a custom-made style, or try a different word shape, simply switch to this font for an additional layout option. 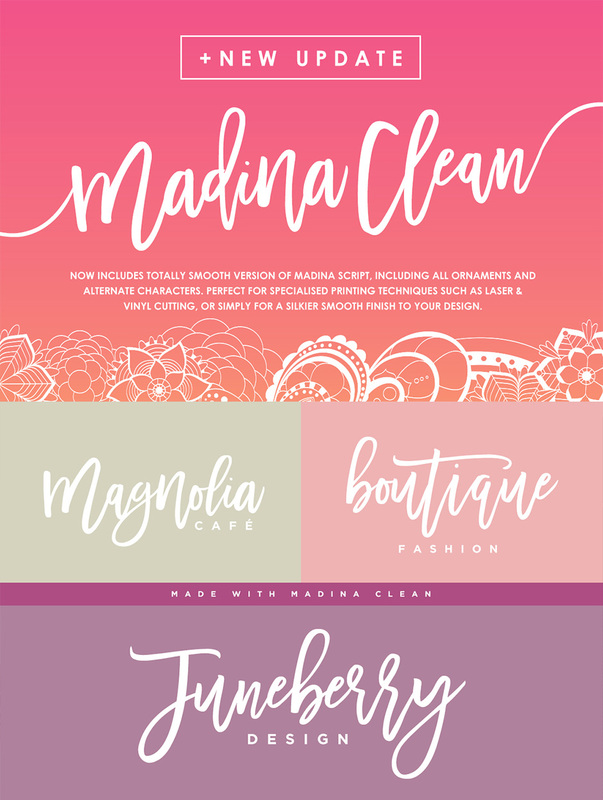 • Madina Clean, Madina Clean Alt & Madina Clean Ornaments – Clean versions of the above 3 fonts, with the rough brush texture removed and replaced with a completely smooth edge. • Fonts are provided in TTF & OTF formats. I recommend installing the TTF files, and the OTF only if necessary. There is no difference in function with either format. File size is approx 5.2MB (11MB unzipped), offered as a single download. I see others have the same questions and issues that I have had. Is there a program that can be used that you do not have to pay the monthly fee? I have the Silhouette Cameo 3 and having issues getting the glyphs from character map into the studio. I can place the glyph into word but not the studio. Is this why I am having this problem because I do not have one of the software’s that you had mentioned? Thanks so much for the comment on this one! I am so sorry you are having issues working with the glyphs on this one. Unfortunately you do need one of the listed professional software types to access the glyphs. I know it can be frustrating with the monthly charges on some of the programmes but as the majority of the designers are working in the likes of PS and AI, that is why the majority of the compatibility is for these programmes. A lot of our community are saying positive things about Affinity as a programme so that might be one to check out as an alternative 🙂 I hope that helps! Can you use this font with word or Microsoft Publisher? Thanks so much for the comment and I can definitely help! So the great thing with fonts is that they pretty much work with every programme :). However, you will need professional design software like Photoshop or Illustrator in order to be able to access the glyphs/ stylistic alternates that come with some of our fonts. I hope that helps! Love this script!! But i’m running into issues in words i have double T’s in.. will you do a fix for this? so maybe both T’s can be crossed with the same line? Thank you so much for reaching out to us and I am so sorry to hear that you are having difficulty with your Madina script. The great news is that the double T is actually included in the stylistic alternates for this font, but does require professional design software such as Adobe Illustrator, Photoshop, InDesign or Inkscape to access these so I am so sorry if you are currently not working in any of these. How can i try this font before i buy it? I bought this in January and clean version came out in Feb. How do I get the clean version so I am to use it with my cameo? Hi, please can you advise whether this will show up on all devices if used on my website? We unfortunately don’t work in PSE ourselves, but I have just checked this online for you and .TTF files aren’t on the list of supported/ compatible file types I am afraid. I’m really sorry for any disappointment caused. I’m really loving using this font, thanks for always having such awesome products! I was wondering if you could tell me the name for the basic font that it is paired with in the samples? I’m having trouble locating one that looks similar. Thanks for the comment on this one and we are delighted to hear you are loving Madina- I hope you are getting loads of use out of it 🙂 I am not sure what the basic font is but ill pop an email over to Set Sail Studios and see if they can shed some light for us on this! I hope this helps and please do feel free to share anything that you create with us as we would love to see what you are working on with Madina. oh I love this font!! does it come with the Icelandic letters Þ þ and Ð ð ? Unfortunately Madina doesn’t have Icelandic language support so i am so sorry to disappoint you on this one! I am very interested in buying the “Madina” don’t but I see that it’s not completely filled black and not sure how this would cut on my Silhouette/Cricut. Any suggestions if it’s possible to “fill” the letters so they cut correctly! Thanks! Thank you so much for your comment and for expressing an interest in Madina Script! I’m really sorry but unfortunately we do not work with Silhouette on our side so I’m unable to test this out on my side and confirm for you. Rest assured though, there are certainly ways for you to fill in the font completely and I’m just popping you an email to assist you with this 🙂 I hope it helps! Thank you so much, Ben! I will figure this out one way or another because I just ❤️ the Madina font! I’ve popped you over an email to let you know how you can get hold of the updated files. Sorry to crash the party – but I have a wish list! I would love, love to have some more backgrounds from Bibi Arts. I was too late on an older bundle that featured the Motion products… but did get the very last bundle, so I got some of the Bokeh backgrounds. Very interested in Motion Sky, and the Polygons look great too. If you can get any more of them – I will buy them. I love the idea of featuring some items from Bibi Arts in our marketplace! I have raised this with the team and we will do our best to source them for you soon so you can tick them off your wishlist! Thanks again for your suggestion, Diana! If there are any other items you would like to see please do let me know! This is great, I’d had my eye on this elsewhere bit I’d much rather buy it Herr. Thank you! We will be steadily adding more items in the next few weeks so please do let me know if there are any items on your wish- list you would like us to try and source for you!